BOM Mobile Banking is easy to use. Access BOM Mobile Banking from any web-enabled device, or download the app for iPhone® or Android® by clicking on the download links below. 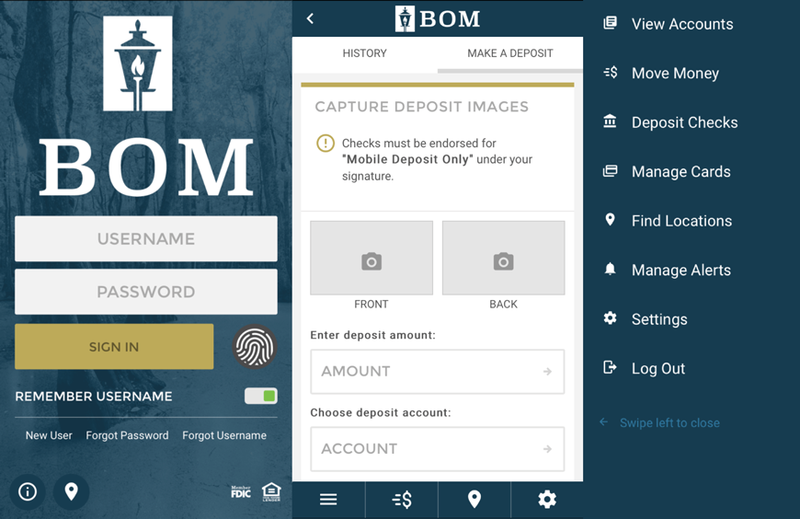 With BOM’s Mobile Banking App you can safely and securely access your accounts anytime, anywhere. Allows our customers to click on the BOM App and automatically be logged in. No need to enter username/password each time. 7. Select Submit; that’s it! APPLE Compatible with iPhone, iPod touch, and iPad.Requires iOS 4.0 or later. Just choose from one of our available text commands, send it to 662265 and we will automatically reply within seconds (Standard text messaging rates may apply). Call us today to sign up for Text Message Banking!